Why on earth did I keep this…? Recently I needed a match, not lighter, but a match. Talk about something that really hasn’t gotten a lot of attention lately is the old fashioned “book of matches”. Growing up in the 1970’s it was commonplace to have books of matches lying around, or in the case of our family, stick matches. There were the usual pilot lights needing to be relit on the stove and such, trash needing to get burned in the ditch (Greenpeace not yet having formed a chapter in New Liberty Iowa, population 89, in 1977) and Fourth of July fireworks (legal and illegal) needing to be ignited….you just had to have matches around the house. At that time in the late 1970’s and early 1980’s I, for whatever reason, collected matchbooks. Businesses would have them lying about their countertops for their customer to pick up and use later and hopefully remember to “come back” and patronize that particular business again. It was a different time, more people smoked and if a kid wanted a pack of matches….”hell kid…go for it.” I’d take the newly acquired matchbook and toss it into an old one gallon pickle jar with the rest of the matchbooks that I’d collected and move onto bigger and better things, which in that time in my life was probably reading comic books, playing with our dog and screwing around playing baseball. Fast forward to the present I now have that “pickle jar of memories”. I went through it last night and wondered why on earth did I keep some of this stuff? I can only imagine that it was sitting on my dresser and as I emptied the contents of my pockets from the days activities various, “things” ended up in the jar. Some of my favorites are listed below in no particular order. Some matchbooks gave you some visual aids to help you find their businesses like…The HIGHWAY 12 CAFE…next to the Deer Park Across From Riverview Park (clear as…what?!) Venison Omelet anyone? Or how about Jimmy Doolittle and Friends Pub…with a detailed map on the back of their matchbook (I don’t think the map is to scale). Liberty Savings Bank is still around ladies and gentlemen and ITS STILL LOCATED IN Scott county Iowa. I wonder how often this came up where someone needing “mortuary services” found this matchbook in their pocket? 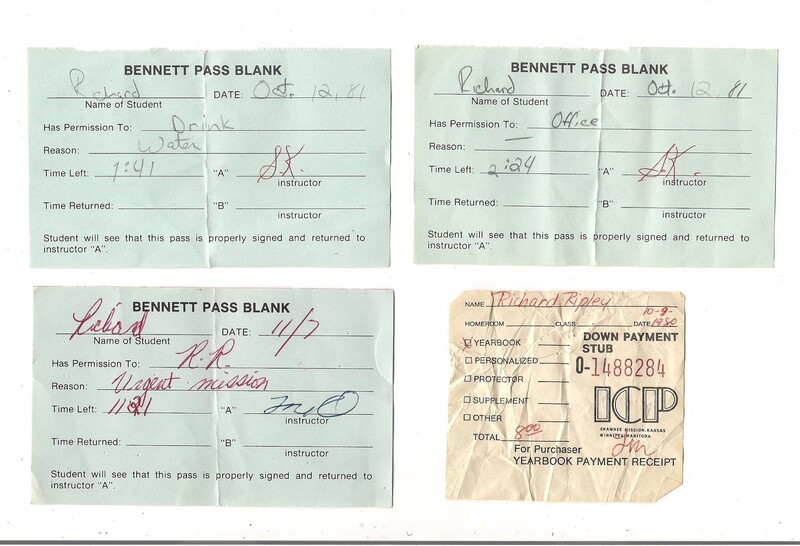 Hall passes from high school. Back in the day a kid couldn’t just go traipsing around the hallways without permission, so you had to have your teacher write you a hall pass. As you can clearly see, October 12th 1981 was a particularly busy hall pass day for me. A 1:41 trip to get a drink of water, then a 2:24 trip to the office (never a good thing). Art teacher Mike Millington sent me on an URGENT MISSION to the RR (restroom) on November 7th. Ahhh…relief AND humor. I’m still waiting for a call that my 1979-80 high school year book is in. I’m keepin’ the receipt until I get it!! A Wally’s Air Service ticket stub from my first plane ride, ever. I was ten years old at the time and it sticks in my memory like a thunderbolt from a cloud. Scared and excited at the same time. My brother Dan took me on this. 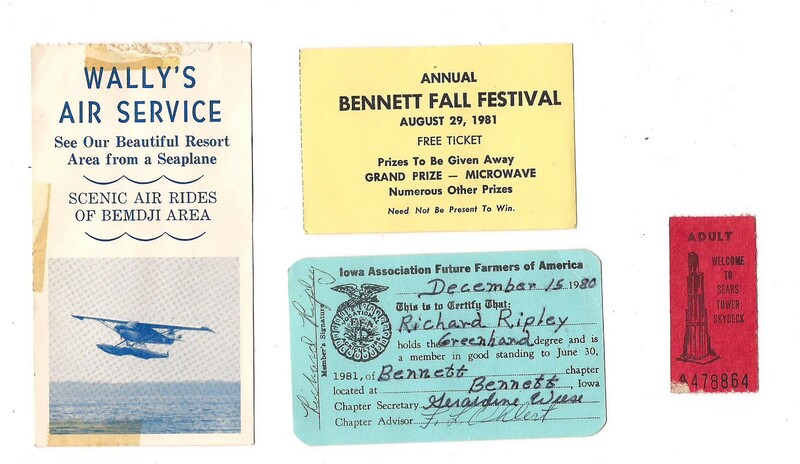 BENNETT’S FALL FESTIVAL in ’81 was a big deal then….giving away a (wait for it….) MICROWAVE OVEN!! My Future Farmers of America GREENHAND membership card from my freshman year, personally signed by Geraldine Weise and Faye Ohlert. A ticket stub from the Sears Tower in Chicago…church youth group trip in 1979. I should recycle this stuff, or throw it out. Its not good for anything, the business’s mostly long-gone…as are the people. Only the simple and common memories of a farm kid from Iowa from nearly forty years ago. Why save them? Until I come up with a good reason I guess that they’ll just have to go back into the pickle jar and wait until I can come up with a good reason to save them. When that happens….they’ll be my adult kids problem to figure out. Until next time….peace to you and yours. ← Wait a minute! How did we get here?! These are just great! Talk about a “bygone time” .. an idea is to keep a few of your favorites and put them in a “shadow box” – craft stores like Michaels & Hobby Lobby have them … my favorite has to be the Mortuary matches. You just can’t make this stuff up! Isn’t that the truth?! 🙂 I have some shadow boxes already of old fishing lures with some black and white photos of our grandparents and my Dad and his sisters in them, though I might just have to come up with something! Have a safe, healthy and productive week in Denver. I’d love one from your wedding, Roxy! !